Habit: Perennial herb 3--8 dm, green, spreading-hairy. Stem: erect. Leaf: cauline; stipules 6--30 mm, 2--10 mm wide, green, some leaf-like; petiole 3--6 cm; leaflets 6--9, 20--60 mm. Inflorescence: 3--20 cm, flowers +- whorled; peduncle 1--11 cm; pedicels 2--7 mm; bract 4--10 mm. Flower: 10--14 mm; calyx upper lip 5--10 mm, 2-toothed, lower 5--12 mm, entire to 3-toothed; petals blue, banner back glabrous, spot white, keel upcurved, generally glabrous (upper margins sparsely hairy near middle). Fruit: 2--4 cm, silky. Seed: 2--6, 4--5 mm, beige, mottled brown. Ecology: Under pines, in granitic soils; Elevation: 1500--3000 m. Bioregional Distribution: SNH. Flowering Time: May--Sep Note: Stipules characteristic. May be part of Lupinus andersonii. 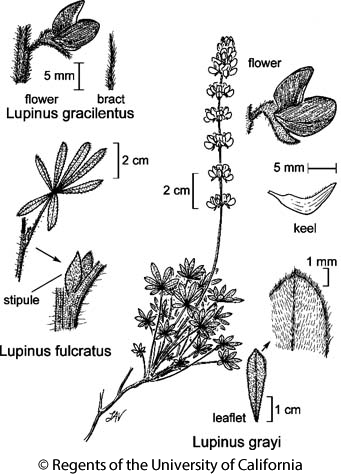 Citation for this treatment: Teresa Sholars & Rhonda Riggins 2012, Lupinus fulcratus, in Jepson Flora Project (eds.) Jepson eFlora, http://ucjeps.berkeley.edu/eflora/eflora_display.php?tid=31884, accessed on April 22, 2019.